It has been a long journey to reach my "dream job." I grew up in Orinda - outside of San Francisco. We were one of the only Chinese families in the community, and my brother and I were raised in a bi-cultural family. I spoke Mandarin Chinese at home - it was my first language - and English in school. We spent our summers in Asia. Growing up, I was immersed in two cultures. 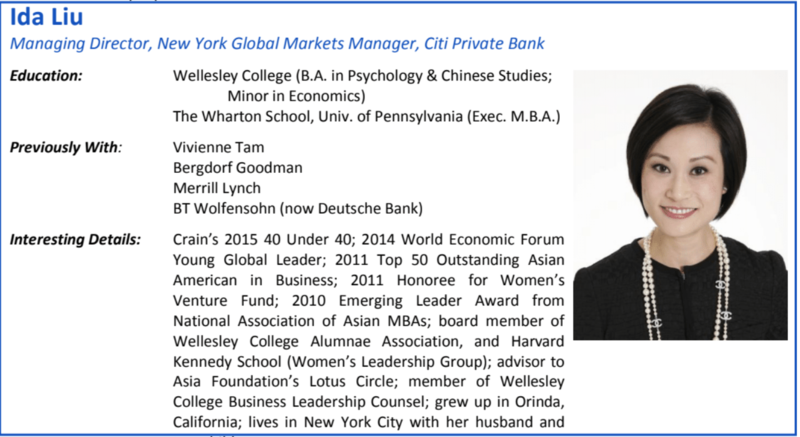 After Wellesley College, I became an investment banker and worked on global deals. With Merrill Lynch, I also worked in Hong Kong. My bi-cultural upbringing was very important, and opened additional opportunities. I was working very long hours in banking - over 100-hour weeks, constant travel, and all-nighters were the norm. I loved the work, but was burning out. I wanted a change. During college, I was a buying intern for Neiman Marcus and always wondered about a career in fashion. Leveraging my network, I became Bergdorf Goodman's Business Manager of European Designers. Then, I became Vivienne Tam's Global Head of Sales and Business Development. Vivienne Tam is widely known as the first "East Meets West" designer. While at Vivienne Tam, many global fashion designers asked me how to invest their money. I had an "AHA" moment. There was a massive void in the marketplace to help designers with wealth management. I pitched the concept of launching and heading a business focused on fashion, media, and entertainment to Citi Private Bank over 10 years ago. The rest is history! I was able to combine the best of both worlds into a job that was extremely rewarding and interesting. Fast forward to today, I am the Global Market Manager for Citi Private Banks in one of our largest global markets. To say that I love what I do is an understatement. I'm passionate about my job. The key lessons I've learned from my career journey - think outside the box and be flexible, know your strengths and leverage them to find your dream job, and be willing to take risks! And remember the mantra, "If you don't ask, you won't get it!" I took public speaking when I was a student at Miramonte High School. The class was taught by Mrs. Sandra Starke, who was widely known as one of the toughest teachers. She held her students to the highest academic standards. At the time, I couldn't imagine speaking in front of a crowd. I still remember the first time I was asked to present in front of the classroom - my heart was pounding and my hands were shaking, but Mrs. Starke kept encouraging me to overcome my fear through repetition and coaching. I flourished to become one of our top public speaking students. I am grateful to Mrs. Starke for helping me find my voice and for seeing the potential in me. There were also two game-changing moments in my career. First, the transition from investment banking to fashion. Second, the transition from fashion to private banking. For both career moves and industry transitions, I had to step out of my comfort zone and take big risks. Luckily, I had wonderful sponsors through my network who believed in me, gave me a shot, and opened the door. The biggest professional challenges also proved to be the most rewarding. I mentioned them earlier - changing industries and taking risks. I still remember the first interview question from the Chairman of Bergdorf Goodman - "You are all about finance and numbers, what are you doing here?" I landed the job in fashion by showing the added value, and the ability to provide a new perspective and think outside of the box. It was humbling at first, but I lead by example - working closely with my team, actively listening, and connecting with clients. This was critical to my success. My other challenge has been breaking the bamboo and glass ceilings! Generally speaking, Asians are taught to be individual contributors, work hard, and get good grades. We are raised to be humble and not tout our accomplishments, although this is exactly the opposite of what we should be doing in Corporate America to advance. Likewise, women are generally less vocal and tend to take less risks. Society is making improvements, but I look forward to the day when we don't need training and development programs targeted at women and minorities. I lead by example and listen. I have multi-level mentors - junior, peer, and senior - both in and outside my industry. I encourage feedback and like to be challenged. I focus on building the best, most diverse teams. We have complex negotiations daily. We compete with other institutions and wealth managers. In preparing for a highly competitive mandate, we always put our clients and their needs first. We use a fully customized and consultative approach. It makes difficult negotiations less challenging when you fully understand your client and counterparty before making your proposal. Due diligence is key. We recently advised a family on cross border investment considerations. They had multiple family members living in different countries around the world. The cross border trust and estate planning was critical. As a result of solving a pain point for them, we were able to become their primary investment advisor and assist multiple family members with global banking, lending, and capital markets needs. We looked for the angle to differentiate ourselves, and that's how we built trust to expand the relationship. I attended a World Economic Forum Young Global Leader executive education leadership program at the Harvard Kennedy School. I was in a class of talented individuals from around the world and in different industries. It made me appreciate my bi-cultural upbringing. Living and working in multiple geographies has helped me understand and respect multiple viewpoints. The world is becoming flat, and the ability to relate to global citizens is critical. I definitely bring that viewpoint to everything that I do - especially in helping my clients achieve their financial goals. Personally, my two young children and my amazing husband! Professionally, building great teams with passion, ambition, and a common vision to be the best at everything we do. Originally published on The Azara Group.